First of all I'd like to point out I already know there a wide variety of posts covering this issue but I'm wondering whether you could help with my case. I was messing around with the GPIO pins. After having created the circuit, I tried booting the Raspberry Pi but it didn't respond (red light). I have tried burning a new image to the microSD card but it doesn't seem to be working; it has already been a week since this. PD: The Raspberry Pi doesn't seem to have any damage, it doesn't get really hot in any special part, and it makes an almost inaduible noise, the processor gets a bit hot, not by far as if it was running. Sounds like what ever you had connected to the gpio has shorted the 5v rail to ground if there is no red LED lit. May be if you leave your pi unpowered for 24 hours the poly fuse might reset if that has blown, I would also remove every thing from the gpio. Perhaps you should post a diagram showing what you had connected to the gpio, then may be we can workout what's wrong. [Sounds like what ever you had connected to the gpio has shorted the 5v rail to ground if there is no red LED lit. Nothing jumps out at me as being wrong in you picture, but you seem to be supplying 3.3v to the LEDs and using the gpio pins as a ground. Most examples supply the 3.3v from the gpio pin and connect the LEDs to ground. I was connecting it properly, I can tell that for sure. Do you think it might be some kind of manufacturing defect? Well you say you pi is dated 2017 that means it can't be a pi3B+ because they were only released in 2018, so you must have a pi 3B or one of the older pi's they are very robust and only tend to fail when you do some thing wrong. Only a few pi3B+ have suffered spontaneous failure of the 3.3v supply no others suffer this problem. Sorry, I meant 2018, but the Copyright trademark was from 2017 . OK so if you power the pi with no SD card installed and nothing plugged in to the gpio, do you have a RED LED lit that shows you have 5v power ? if you have a volt meter you can also check the 5v and 3.3v pins for voltage, I would suggest you plug a dupont cable on to the pin and then connect that to the meter leads as connecting the meter lead directly to the gpio pin can easily lead to shorting to other gpio pins that could damage your pi. Well, I checked what you told me, this is what I got (I am really new at this, so I correct me if I did anything wrong). You appear to have your meter set to the 20 volt AC range. You should set it to the 20 volt DC range. ... and the red power LED is lit, so there really is 5v of some sort arriving at the Pi. Thanks for your help, I really appreciate it. I followed all the steps, connected to DC voltage (20V). I am getting 5.11 V when connecting it to the 5V pin and GND but 0 when connecting 3.3V to GND. The PSU is suitable for the RPI, the output specs are 5V and 2.5A, the seller recommended it to me. 5.11V is just fine but the missing 3.3v means the on board voltage regulator has failed. so your pi is dead so a replacement is probably your only option as repair requires specialist soldering equipment if you can get the right part. I wonder if supplying the LED's from the 3.3v line and using the gpio as ground was the cause of this ? the normal way that most people and example would do it is to use the gpio at the supply and a ground pin for the ground. I don't think the circuit was the cause, I was following a tutorial from a trusted site. Well, I guess I am gonna have to buy a new one. Just in case, could it be a manufacture deffect? Some pi3B+'s have failed due to a problem with the on board voltage regulator, but this normally happens on first boot or soon after, you can't rule out your connections to the gpio being the problem. Last edited by pcmanbob on Wed Jan 16, 2019 6:29 pm, edited 1 time in total. How can that make a difference? One way, current goes from the 3v3 supply, through the SoC, out the GPIO and through the LED to ground. The other way, current goes from the 3v3 supply, through the LED, into the GPIO and through the SoC to ground. Either way, the same current goes from the 3v3 supply to ground. Admittedly it enters and leaves the SoC through different pins and uses different FETs in the SoC, but I can't see how the PMIC could object to one and not the other. I based my idea on the fact that the pi3B+ will not boot with some hats attached when they use the 3.3v pin to supply power. it was only an idea, did not say it caused the problem. shorting the 3.3v pin to ground is a more likely to have been the cause of the problem. If you are sure you did not short anything, especially 3V3 to 5V, but could just be GPIO to a supply rail, then it is probably a defect covered by warranty. Talk to your supplier. RPT have said there is an issue under investigation, but have not indicated the nature or scope. If you did short something, then things are harder to sort out. The PMIC (power management IC) spec says it is short-circuit proof, but that may not extend to a Pi using a PMIC. I would not expect short circuit tolerance to include shorting 5V to 3V3. Sincererly, I can't assure I didn't short anything. Both rails had been working properly, it happened when I connected this circuit (which seems to be Okay). I'll contact the supplier and tell them about the issue. 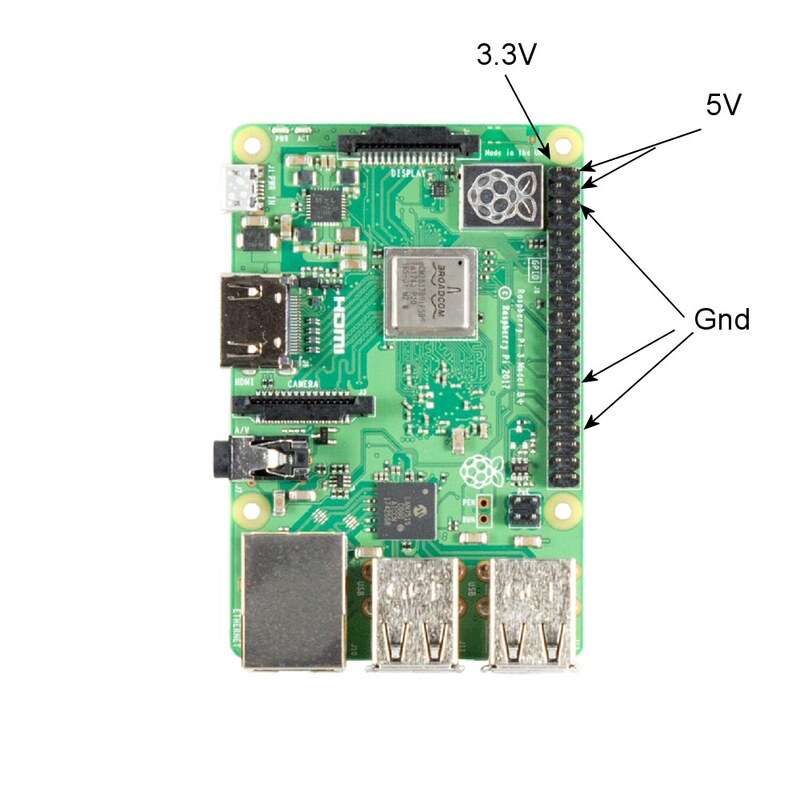 If you pi only failed on first boot after connecting the external circuits to the gpio then I would say you need to look very closely at you external circuit to make sure it was not the cause before you connect it to your new pi. could it be a manufacture deffect? That's a contentious one. Because it failed when you connected your circuit there is going to be suspicion that you did something wrong which caused the failure - even if you didn't or don't believe you did - but on the other hand the PMIC which you appear to have damaged is supposed to be immune to over current caused by shorts. I would say; read the Boot Problems Sticky then contact whoever sold it to you. ....and cost less if you make a big blunder (unless somebody vehemently insist a $10 or $25 is more expensive than a $35, I fold). Once you've tested it fully, without any mistakes, then you may transfer the "final" circuit to the RPi3B+. Having a second Pi to experiment with also means you keep your main Pi safe if things do go wrong; it will still be infuriating and frustrating when things go badly but it won't be the end of the world when they do. I recently acquired a secondhand GPIO connected LCD. That's on an original Pi B 'just in case'. That limits the consequences should it have failed when first powered it up and while I am experimenting. When I acquire a new PSU I will power up that Pi B without an SD Card before connecting it to anything else. Better to let the magic smoke out there than elsewhere. It's all about minimising and limiting adverse outcome.